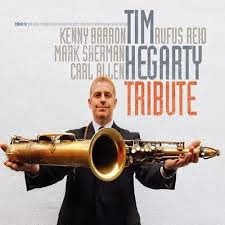 bebop spoken here: CD Review: Tim Hegarty - Tributes. Tim Hegarty (ten/sop); Kenny Barron (pno); Rufus Reed (bs); Carl Allen (dms) + Mark Sherman (vbs) on 4 tracks. Tim Hegarty is, or rather was, an unknown name to me. The blurb tells me he's been a force on the New York City jazz scene for some 25 years - and well he may be. Hegarty is one of those players who come up on you from left field and leave you saying, "Where have you been all my life?" This is class tenor (and soprano) playing in the best Dexter early Trane tradition perhaps even with a hint of Ike Quebec. The late Chris Yates would have described Hegarty as a "Tough Tenor" and I'm not going to argue. Think of those 1950's Prestige, Blue Note or Riverside recordings and you've got the gist - well almost. This is 2013 and, whilst the old values permeate his playing we have moved on and Hegarty has absorbed many of the innovations that came along over the years (and discarded a few!). The title "Tributes" gives us a clue to the inspiration behind the album. It's an offering to all his teachers, both in person and on recording. Jimmy Heath, George Coleman, Coltrane, Monk, Frank Foster, Dexter, Sonny, Ben Webster, Michael Brecker and Bird. He learned well and who knows but that in a retrospective parallel universe (if that makes sense!) his teachers could now be learning from him! If you want just one track Pannonica is the icing. Now I must apologise for neglect. Hegarty is superb but equally magnificent are Kenny Barron (is he ever otherwise?) on piano. Rufus Reed - no better foundation - and Carl Allen who, years ago might have been the guy who put the Benzedrine in Mrs Murphy's Ovaltine, now is the man who injects the Red Bull into the modern jazz musician's Perrier Water. Oh yes, and great vibes from Mark Sherman who dishes out the adrenaline on a few tracks. Mark also produced the disc. This is going to be in the December shake-up! Tim Hegarty: Tributes is available on Miles High Records MHR 8623.